Combining your flight + hotel together in a package booking means you can save even more on your next holiday. 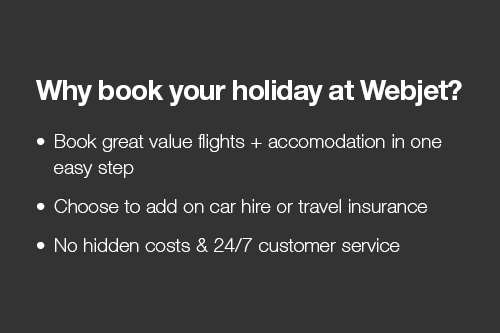 On average, Webjet customers who booked a holiday package saved a huge $506* compared to the price of booking their flight + accommodation separately. Start your packages search today and build your ideal holiday. *Based on the average saving for Webjet package bookings made between 1 December 2018 and 28 February 2019. Savings represent the difference between the displayed cost of the package as payable upon purchase, compared to the cost of the same airfare and the hotel rate before promotional discounts are applied, when the flight and hotel are purchased in two separate bookings at Webjet. Savings will vary based on origin/destination, length of trip, number of travellers, stay dates and selected travel supplier(s).